“It is only when science asks why, instead of simply describing how, that it becomes more than technology. When it asks why it discovers Relativity. When it only shows how, it invents the atom bomb, and then puts its hands over its eye and says: ‘My God what have I done?” –Ursula K. Le Guin. “The unleashed power of the atom has changed everything save our modes of thinking and we thus drift toward unparalleled catastrophe.” –Albert Einstein. Einstein’s great formula: E=MC² became the catalyst for the development of the atomic bomb during the height of World War II. As research teams in the United States were racing to invent such a bomb, it was known through intelligence that German scientists were doing the same thing. The grim fact was that the first army to get a working bomb was going to win the war. That the United States and allied forces managed to sabotage the German nuclear projects at Norsk Hydro in Norway and the Oranienburg facility in Germany helped us win this vital contest and thus emerge from the war as a major world power. The time of jubilation and pride over our achievement was short-lived, however. The world spy network, such as it has been, was actively at work stealing the plans for building nuclear bombs. The Russians got there first. The French and British, who were close allies during the war also had an early possession of the bomb. Then the Chinese had it. Somewhere along the line we gave the technology to Israel and Pakistan. Then India had a bomb. In spite of efforts by President John F. Kennedy and presidents to follow him to negotiate for a world nuclear disarmament, the number of nations gaining access to the bomb has been growing. North Korea recently joined the world nuclear weapon states, and now there is rhubarb over the thought that Iran is attempting to build a bomb. The great concern is that any one of these nuclear powers might choose to use these deadly weapons in the event of a war with another country. And there has been a long and ugly history of warfare that rages almost non-stop among nations for as long as there has been a historical record. That we invented such a heinous weapon has forced humanity into a stranglehold. Either we advance ourselves into a civilized society or we continue to behave like animals and eventually annihilate ourselves. One area of great concern has been the threat of a nuclear confrontation between India and Pakistan at the Kashmir border. That small slit of property dividing the two nuclear nations has remained a bone of contention ever since 1947 when the Hindu-majority India and the Muslim-majority Pakistan were divided and released from British rule. Kashmir was left with the option of joining either country, it has never made a decision, and the two nations have been staring down gun barrels at one another ever since. The issue has escalated since Islamabad decided to place tactical nuclear arms along the Indian border and left the decision to fire them up to local commanders. Those of us who grew up during the Cold War years remember the constant threat that the Soviet Union might strike the United States with its great nuclear arsenal mounted on a battery of anti-ballistic missiles capable of striking any city on the continent. The fear was so great people were building bomb shelters in their back yards. We remember having to practice cowering under our school desks, with our arms over our heads, in the event of a blinding flash that signaled a nearby nuclear attack. We lived in daily fear in those days, especially during the Cuban Missile Crisis when Kennedy faced off with Soviet Premier Nikita Khruschchev, both men’s hands on the nuclear button while talking to one another on the hot-line between Washington and Moscow. That was probably as close to a world nuclear holocaust as we ever came. It quickly became obvious to world leaders, especially after that episode in 1962, that something had to be done to put the brakes on the growing issue of nuclear insanity. But how could we do this? Nuclear power plants were springing up all over the world and our military ships at sea were now operating on nuclear power. A stockpile of plutonium, the by-product of generating nuclear fuel and the essential force behind nuclear bombs, was building. The genie was out of the bottle and it seemed that getting world leaders to cooperatively work to get it under control was an almost impossible task. Organizations like the North Atlantic Treaty Organization (NATO) and the United Nations have been working to get member nations to collectively agree to at least reduce the number of nuclear arms in their arsenals. While the United States and Russia have signed agreements to cut their number of bombs, to stop above-ground testing and even stop developing new and more powerful nuclear weapons, the latter agreement has not happened. The newest nuclear weapons are more sophisticated and perhaps more deadly than ever. The United States, for example, has developed the B61 Mod 11, a hardened penetration bomb with a reinforced casing containing depleted uranium and delayed action fuse. It is most commonly known as the “bunker bomb” that will penetrate deep ground fortifications. Such bombs were used during the Iraq war. We also used conventional bombs and shells with tips laced with depleted uranium, which were, for all practical purposes, a form of nuclear weaponry. After years of participating in a post-Cold War policy of lowering our military nuclear arsenal, the Bush Administration announced plans to research and develop a new “family” of tactical nuclear weapons for use against “terrorist enclaves and hostile nations.” We suspect these weapons were already developed and ready to use when we heard about them. Mr. Bush and generals in the Pentagon were obviously anxious to try out their new toys on the innocent people of Iraq. For these fellows, the thought was: to hell with the concept of non-proliferation. That the Bush Administration took the action it did in an unprovoked war in the Middle East did little to convince the rest of the world that the United States could be trusted under nuclear disarmament treaties. Indeed the May 2012 conference of the Non-proliferation Treaty held in Vienna was a total failure. 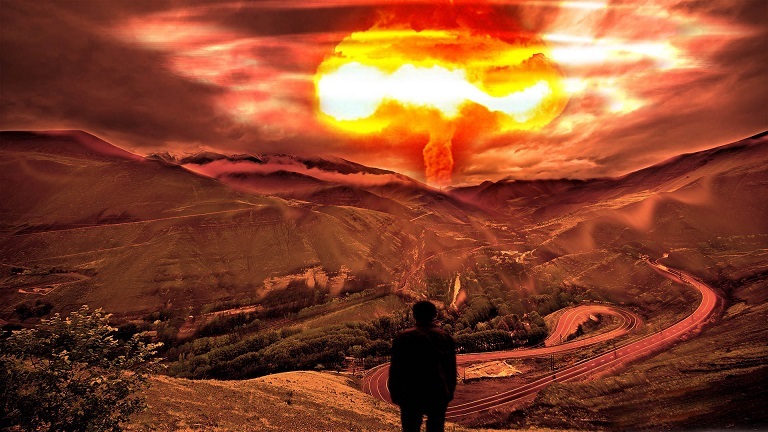 Countries armed with nuclear weapons all expressed a refusal to commit themselves in a process of nuclear disarmament. The 28 heads of state meeting in Chicago in May for the NATO summit, however, agreed to work for “international diplomacy” in the area of nuclear militarization. While all NATO leadership agrees that something has to be done to solve the growing threat of world nuclear destruction, none of the nations possessing these weapons appear willing to give them up. Every nuclear armed state attending the Vienna conference made it clear that they intended to maintain their arsenals to assure the security of their country. Brazil does not possess nuclear weapons. The United States has had slightly greater success since that disappointing meeting. After months of talks, Vice President Joe Biden was heavily involved in reaching an international nuclear agreement with Iran and five members of the United Nations Security Council in July, 2015. Also named in the deal were China, France, Russia, United Kingdom and the European Union. The agreement is simple: Iran says it will not stockpile enriched uranium or build heavy-water facilities, preludes to building nuclear bombs. It took a lot of work to head off yet another world nation from possession nuclear weapons. There has been no further progress toward eliminating the massive stockpile of bombs still in existence.